When I was a kid, I stumbled into reading Doc Savage novels because I mistook them the basis for the fictional character Mark Savage from the short lived television series Tenspeed and Brownshoe. Thankfully, my error produced a better result than I'd anticipated, throwing me into the pulp world of Clark Savage and his team of heroes. My first Doc Savage book was a Golden Press hardback of The Sargasso Ogre, which was mostly green for obvious reasons. 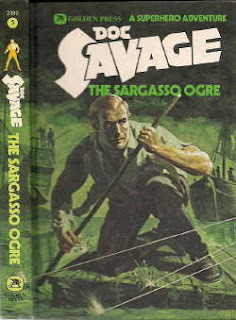 Both my perception of Doc Savage as epitome of globetrotting explorer-adventurer and my nostalgia for those Golden Press hardbacks were both evoked (the greenery, and the very feel of the Canadian edition hardback!) 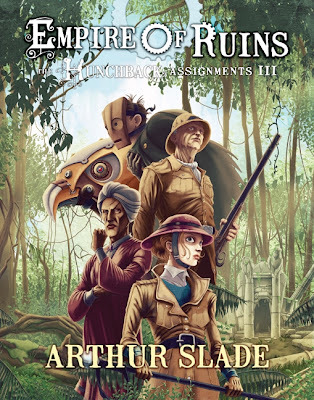 by Empire of Ruins, the latest installment in Arthur Slade's The Hunchback Assignments. This won't translate well for Stateside readers picking up the trade paperback editions from Random House, which utilize that YA Photoshop approach that renders Modo as a sort of Goth-styled hero, more pale than hideous. Those covers never captured my imagination nor inspired my nostalgia like the Canadian editions from Harper-Collins, which are hardback with a cartoon style cover by the masterful Christopher Steininger. I'm not sure what it says about the difference in markets between our countries, but despite receiving the first two from Random House as ARCs, I have since bought Canadian editions of the first two books because of my love of the covers. These are books you can judge by those covers: Slade produces what Steininger promises. In the case of Empire of Ruins, that means an expedition in the Australian rainforest, with Modo's close companions along for the adventure. Tharpa, Modo's combat trainer, and one of my favorite characters in the series, finally makes the cover! 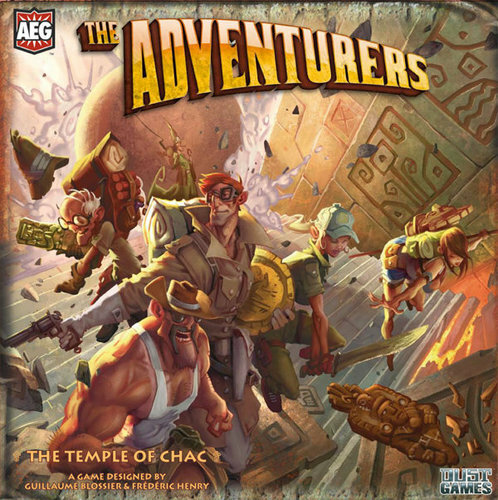 The pith helmets, Mr. Socrates rifle, and Modo's enigmatic new mask put me in mind of Alderac Games' The Adventurers: The Temple of Chac boardgame, and by extension, Indiana Jones and all the bad direct-to-video spinoffs Raiders spawned. My love of the "into the jungle" exploration adventures was definitely a motivator in my interest in steampunk.And as I opened Empire of Ruins to the first page, I wasn't disappointed. We find Modo in media res, having just fallen into the Australian rainforest from an airship engaged in battle far above him, pursued by men in the trees using animal sounds for signals, about to fall into a pit trap filled with spikes. And then he takes us back nine months earlier, to wend our way back to that moment with Modo. The journey is filled with Slade's usual mix of light-hearted humour, engaging characters, high adventure, and near-death escapes. There's nothing philosophically earth-shattering here, but it's well written escapism filled with personalities this reader has come to love. Like the earlier installments, Empire of Ruin is both plot-driven for those seeking the page turner, and character driven for those who couldn't care less about one more moment of derring do (in some ways, the difference in the US and Canadian covers realizes this dichotomy). Readers of the earlier books will be pleased to know that like Scott Westerfeld, Slade has no intention of stringing along the relationship between his leading man and lady ad nauseum. Modo and his fellow agent, Octavia. It's no spoiler to reveal that Octavia finally sees behind Modo's mask: it would be a spoiler to say whether or not she sees beyond it. It's an emotional moment, but that's as much as I'll reveal. Modo continues to work out the complexities of the father-son relationship he shares with his boss/benefactor, Mr. Socrates, who represents the "for Queen and Country" man in the series. Modo provides the oppositional "punk" perspective, trusting to instinct rather than blind obedience, which produces a number of tense moments for the young man and his mentor. Sadly, even with my endorsement, many will pass Slade by because his work is classified as Young Adult reading. Some of the best steampunk written in the last ten years is aimed at the Young Adult market: Scott Westerfeld's Leviathan, or Philip Reeve's Larklight. Two of my favorite series have not only been Young Adult, but also Canadian: Kenneth Oppel's Airborn trilogy, and Slade's Hunchback Diaries. Maybe I just like them because of where they take me: back to a simpler time in my life when summer afternoons were filled with hours of reading stories of adventure and exploration, followed by more hours of actual adventure and exploration, with hiking books, canteen, and backpack, in the coulees and creeks around my hometown of Medicine Hat. Maybe it's because that when they provide social commentary, it's rarely overwrought or in my face, but rather a facet of a character's perspective. 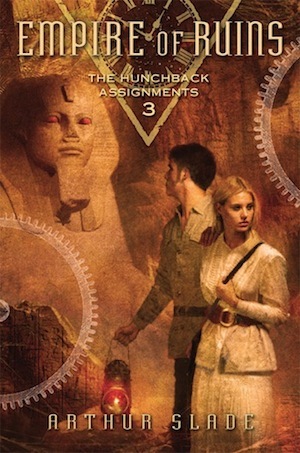 Or maybe it's because I'm just a sucker for a book involving pith helmets and ancient ruined temples. Whichever it is, it was a delight to journey with Modo this past summer, and my only regret is that I didn't have the time to tell you sooner. I was too busy playing Adventurers with my son, and dreaming of being an academic who wears a fedora and a satchel, and carries a whip. If that's your brand of fun, then Empire of Ruins is for you. Oh, my - memory lane. My father bought me that same green hardback of "The Sargasso Ogre", along with a red hardback of "Death in Silver". I still own all of mine! I've had to tape "Man of Bronze" back together, it's been read so many times.